Now that the Jio Payments Bank, a 70-30 JV between Reliance Jio and SBI, has been operational for some time, the two companies have announced a new digital partnership to offer digital banking, commerce and other financial services to customers. The services would be provided through SBI’s digital banking app, YONO (you only need one). In a press release on Thursday, Jio said that the new initiative will not only “increase SBI’s digital customer base multi-fold”, but will also “bring next generation” banking to customers. 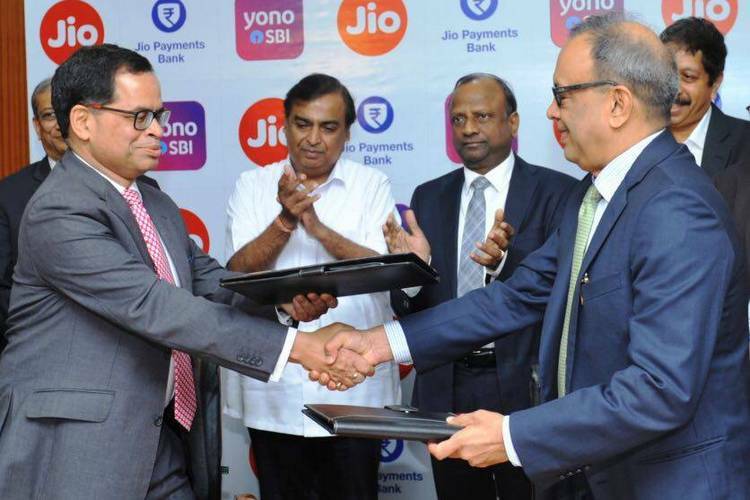 As part of the partnership, SBI YONO’s digital banking features and solutions will be enabled through Reliance’s MyJio platform “for a seamless, integrated and superior customer experience”. The release further states that SBI will be engaging Jio as one of its preferred partners for designing and providing network and connectivity solutions, while Jio’s data network in urban and rural regions will allow SBI to launch customer-centric on-demand services, such as video banking and more. Additionally, JioPhones will be available on special offers for SBI customers. The Chairman of Reliance Industries, Mukesh Ambani, and SBI Chairman, Rajnish Kumar, both expressed satisfaction at the tie-up, and reiterated that the partnership will be beneficial to all concerned, including the two companies, and their hundreds of millions of customers in the country and beyond.